I love cooking with shrimp--a). because it's easy b). because it's relatively healthy and c). because it's darn tasty. 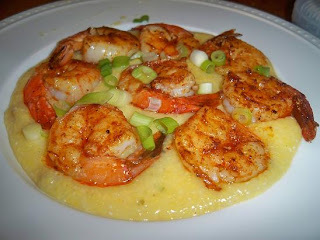 The following is a recipe for paprika flavored shrimp over a sweet/savory polenta. My inspiration came from two recipes from the June issue of Bon Appetit, but I altered them so much that they became my own. Here they are--and the beautiful thing is that this meal will be ready in about 30-40 minutes tops. Brush shrimp with a thin coat of olive oil and sprinkle well with salt and pepper on both sides. Then rub with paprika on both sides. Sautee on medium heat (in olive oil) for about 2 minutes on each side or until the shrimp curl slightly. Let cool for a few minutes and sprinkle with fresh scallions. Cook polenta according to directions. Stir in scallions, golden raisins, lemon zest, salt and pepper. Let cool for a few minutes. Spoon into a deep dish and top with paprika shrimp.